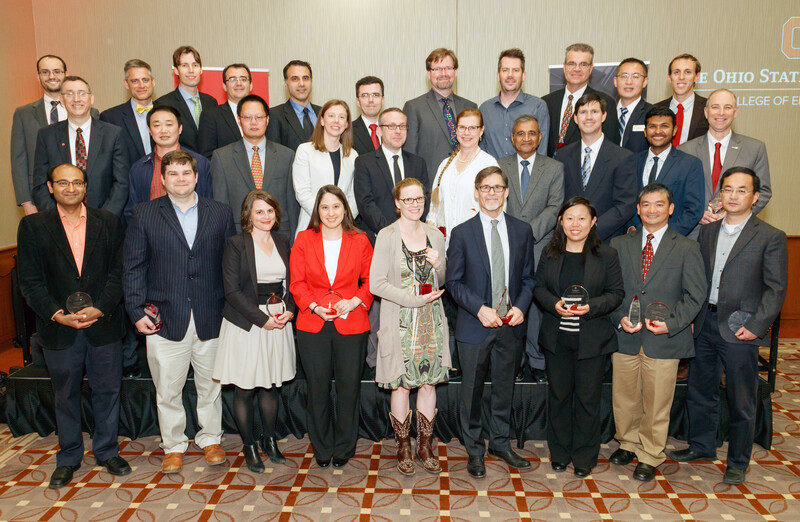 19th Annual College of Engineering Distinguished Faculty Awards HonoreesThe College of Engineering annually honors faculty and researchers for outstanding teaching, research and outreach at the Distinguished Faculty Awards. The 2016 awardees were recognized on April 26 in the Blackwell ballroom. Eylem Ekici, ECE, for leadership in electrical and computer engineering research and education, including fundamental advances in network algorithm design. Bharat Bhushan, MAE, for his pioneering contributions to tribology, the science of adherence and friction. George Blankenship, Lincoln Electric North America, for the development of a strategic industry-university partnership between Lincoln Electric and Ohio State spanning more than 15 years. Ryan McPherson, ECE, for demonstrating outstanding teaching, dedication to student achievement and learning, devotion to helping students, and major contributions to curriculum development in the Department of Electrical and Computer Engineering. Mark Ruegsegger, BME, for providing his students with the valuable opportunity to work in multidisciplinary and multicultural teams to design and commercialize solutions to real-life biomedical engineering problems. Jeffrey Bons, MAE, for the innovations, dedication, energy and creativity he employed to develop the senior-level experimental projects course sequence in the aerospace engineering curriculum. Betty Lise Anderson, ECE, for her enthusiastic mentoring of faculty members, especially recently recruited women faculty members in the ECE department. P. Chris Hammel, Physics, College of Arts and Sciences, for building and sustaining collaborative research between physics and engineering in advanced electronic and magnetic nanomaterials through innovative measurements and for multi-college leadership of the Center for Emergent Materials. Betty Lise Anderson, ECE, for her leadership in establishing the Electrical and Computer Engineering K12 Engineering Outreach program, which has reached over 12,500 students by taking exciting hands-on engineering projects to more than 80 schools, and dozens of summer camps, libraries and after school-programs. Jessica Winter, CBE, for her commitment to developing future diverse leaders through mentorship, research and teaching. Chi-Chih Chen and Can Emre Koksal, ECE, for developing, prototyping and transitioning an RF energy harvesting smart-phone cover design. Shawn Midlam-Mohler, MAE, in recognition of his research with Honda, and his significant involvement with Honda’s investment in the OSU Motorsports teams and the SIMCenter. His engagement in many facets across the university is exemplary and shows Shawn’s strength as a researcher and professor. Seth Young, CEGE, in recognition of his enthusiasm to inspire and help students to learn about engineering both inside and outside of the classroom. Raymond Cao, MAE; Anne Co, Chemistry and Biochemistry; and Yuan F. Zheng, ECE; in recognition of the impact their research has had on the safety, efficiency and security of the nuclear energy supply of the country, as well as energy storage. Jacob Boswell, KSA, Landscape Architecture; Kristi Cheramie, KSA, Landscape Architecture; and Mattijs van Maasakkers, KSA, City and Regional Planning; for their projective planning system of land exchange, accessing vacant sites and transforming them into flexible resources for the provision of urban services and proper public purposes. Their land exchange model is currently being tested in New Orleans, Louisiana and Lima, Ohio. Chi-Chih Chen, ECE; Michael Durand, Earth Sciences; Kenneth Jezek, Earth Sciences; and Joel Johnson, ECE; in honor of their research in the area of microwave remote sensing of ice sheets, specifically the ultra-wideband software defined microwave radiometer.